Two drawings of sculpture on the stupa rail at Bodhgaya (Bihar), made by Kittoe during his investigation of the site. 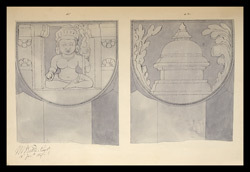 January 1847.
bl.uk > Online Gallery Home	> Online exhibitions	> Asia, Pacific and Africa Collections	> Two drawings of sculpture on the stupa rail at Bodhgaya (Bihar), made by Kittoe during his investigation of the site. January 1847. Pen and ink drawing of two sculptured posts from the railing of the Mahabodhi Temple at Bodhgaya, by Markham Kittoe (1808-1853), from an album of 44 drawings (24 folios) of sculpture on the stupa rail at Bodhgaya (Bihar) made by Kittoe during his investigation of the site, January 1847. Cover inscribed: 'Kittoe's Drawings. vol. 2. The Buddhagaya Rail.' Drawings inscribed: 'M. Kittoe. Capt. '; also with dates varying from 11 to 19 January 1847.